This name can be either a patronymic or a metronymic, meaning it may be derived from the name of the first bearer's father or mother. As a patronymic, it derives from "Han(n)", a Flemish form of John from the Hebrew "Yochanan" meaning "Jehovah has favoured (me with a son)". "Hann(e)" was a very popular christian name in 13th Century Yorkshire, appearing frequently in the 1274 - 1297 Court Rolls of the Manor of Wakefield. The surname from this source is first recorded in Yorkshire in the early 14th Century (see below). As a metronymic, the surname derives from the medieval female given name "Hann", a short form of Hannah from the Hebrew "Chana" meaning "God has favoured me". One Robertus Hanson appears in the 1379, Poll Tax Returns Records of Yorkshire. On April 29th 1541, Richard, son of Richard Hanson, was christened at Dewsbury, Yorkshire. 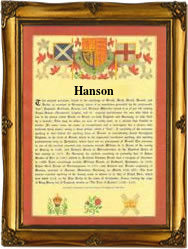 A family by the name of Hanson were established in America by John Hanson, one of four brothers sent there by Queen Christina of Sweden in 1642. They were grandsons of an Englishman who had married into the Swedish royal family. The first recorded spelling of the family name is shown to be that of William Hanneson, which was dated 1331, in the "Patent Rolls of Yorkshire", during the reign of King Edward 111, known as "The Father of the Navy", 1327 - 1377. Surnames became necessary when governments introduced personal taxation. In England this was known as Poll Tax. Throughout the centuries, surnames in every country have continued to "develop" often leading to astonishing variants of the original spelling.